Neither Mr. Laurel nor Mr. Hardy had any thoughts of doing wrong. As a matter of fact, they had no thoughts of any kind. Although a vast majority of Laurel and Hardy's previous efforts ranged from above average to very good ('45 Minutes from Hollywood' being the only misfire and mainly worth seeing as a curiosity piece and for historical interest, and even that wasn't a complete mess), 'Two Tars' for me was their first truly classic one with close to flawless execution. Didn't find 'The Hoose-Gow' as one of their best and a bit disappointing compared to their late 1928 and previous 1929 efforts, which were among their best and funniest early work. It is still good with a lot of great merits. It may not be "new" material as such, some rather familiar material here and the first part takes a little bit too time to get going. 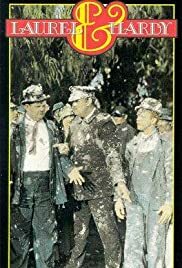 Compared to the late 1928 and previous 1929 output, it is a little on the subdued and bland side, contrary to the insane craziness and wacky slapstick that was properly starting to emerge. When 'The Hoose-Gow' does get going, which it does do very quickly, it is good enough fun, not really hilarious but never less than amusing. It is never too silly, the energy is there and the sly wit is here, some of the material may not be new but how it's executed actually doesn't feel too familiar and it doesn't get repetitive. Laurel and Hardy are on top form here, both are well used, both have material worthy of them and they're equal rather than one being funnier than the other (before Laurel tended to be funnier and more interesting than Hardy, who tended to be underused). Their chemistry feels like a partnership here too, before 'Two Tars' you were yearning for more scenes with them together but in 'The Hoose-Gow' we are far from robbed of that. Their comic timing is impeccable. 'The Hoose-Gow' looks mostly good visually (even if the polish is not always there), has energy and the direction gets the best out of the stars, is at ease with the material and doesn't let it get too busy or static. The supporting players are solid.